Grease a 12x15 inch pan. 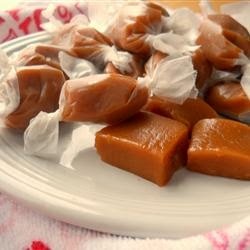 In a medium-size pot, combine sugar, brown sugar, corn syrup, evaporated milk, whipping cream, and butter. Monitor the heat of the mixture with a candy thermometer while stirring. When the thermometer reaches 250 degrees F (120 degrees C) remove the pot from the heat.